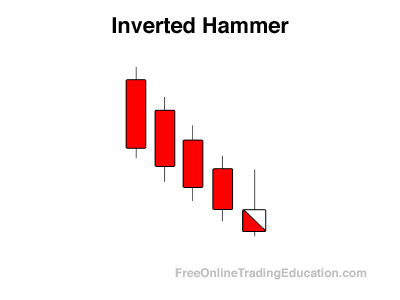 A Inverted Hammer is a single candlestick (regardless of real body color) bullish reversal signal that develops after a down leg. It opens lower, then trades higher, but closes back near its open. Conversely, if the candlestick is formed after an up leg where it opens higher, trades much higher, but then returns to close near its open, it is considered a Shooting Star. Technical analysts use Inverted Hammers as a potential buy signal. Additional confirmation is often needed in the form of another longer term bullish trade setup if needed.